Shortly after 6:00 on the morning of August 8, 1905 the housekeeper of the rectory of St. Thomas Church on Fifth Avenue, Mrs. Sandsbach, discovered a fire raging in the sanctuary of the church. Mrs. Sandsbach ran screaming into the street, alerting policeman Thomas Hewitt who pulled the handle of a nearby firebox. By 8:00 the Richard Upjohn-designed church, the third building for the congregation, was a smoking ruin. Destroyed were the interiors by John LaFarge, including two important paintings, and sculptures by St. Gaudens. 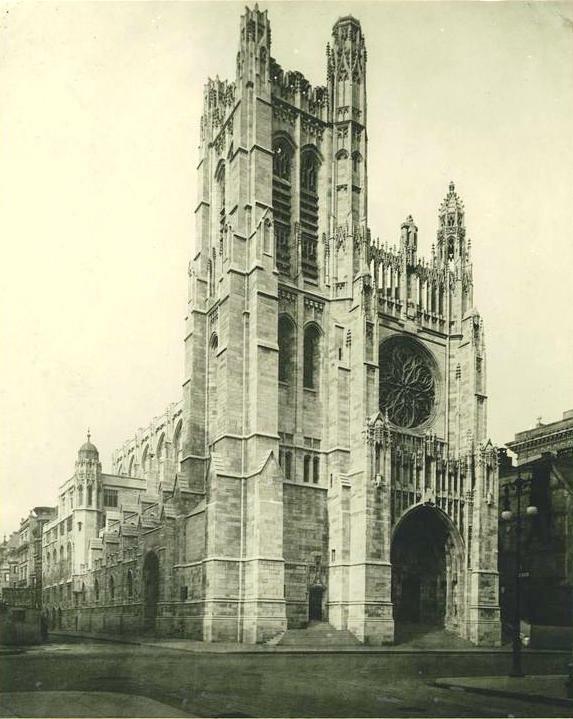 St. Thomas Church was perhaps the wealthiest congregation in the country, sitting on 5th Avenue at 53rd Street among the palatial mansions of New York’s elite like the Vanderbilts and Rockefellers. “One parishioner has already offered $50,000 toward the necessary expenses,” said Stires. The new church would have risen quickly, given the amount of money donated by the moneyed members; however when in 1906 the San Francisco Earthquake devastated that city Reverand Stires sent the entire building fund to California to assist the victims. Fund-raising had to be started anew. The congregation met in a temporary wooden structure on the site for five years before construction started on their new edifice. Ralph Adams Cram and Bertram Grosvenor Goodhue, principals in the firm Cram, Goodhue and Ferguson and both esteemed ecclesiastic architects, were given the commission. 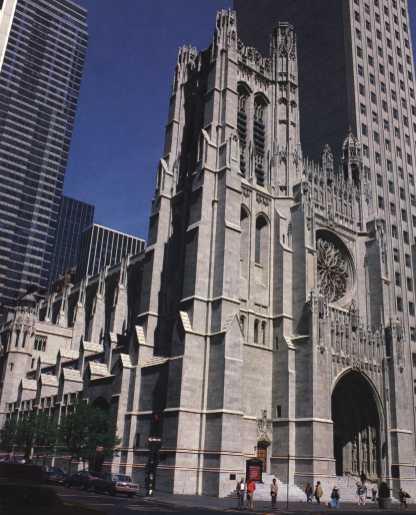 Their French High Gothic church would rival St. Patrick’s Cathedral a few blocks to the south. “The new church…will resemble Westminster Abbey in some particulars,” it said. Goodhue and Adams insisted that no steel be used in the construction of the building, using only stone as in their medieval models. The stone was quarried in Kentucky, the interior being made of a “warm golden sandstone” and the exterior “a silvery limestone.” Guastavino tiles would be used for the high vault. The cornerstone was laid in 1910, sitting squarely atop the two former cornerstones. Construction was not without problems, however. The millionaires’ mansions around the site were shaken daily by dynamite blasts as the foundation was prepared. On September 7, a particularly severe blast sent showers of rocks onto the roofs and conservatories of the houses nearby; one boulder piercing the roof of William A. Kissam’s residence. “A shower of stones, some as big as paving blocks, fell on some of the best houses in the neighborhood,” reported The Times. The church was completed in 1913 and despite Reverend Stires’ protest that “I wish to especially emphasize the fact that the new church has been planned without any attempt at display,” its proportions were cathedral-like, the nave soaring upwards 95 feet. 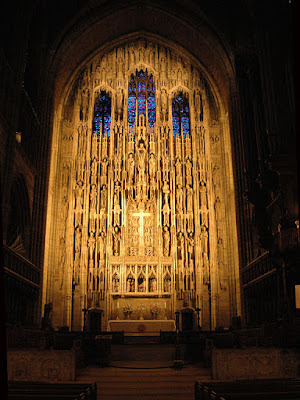 Visually staggering was the magnificent 80-foot high carved stone reredos, one of the largest in the world, pierced to expose Chartes-like stained glass windows high above the altar. 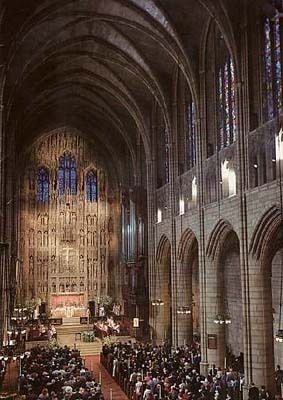 The breath-taking windows were designed by the English stained glass artist, James Humphries Hogan. Outside, the bell tower rises 15 stories. 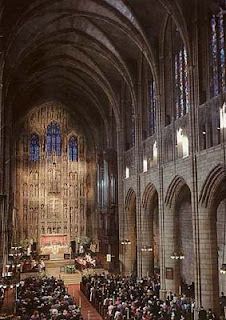 The triple-arched entrance way, the immense central rose window and the sumptuous, overall carvings and Gothic ornamentation immediately cast St. Thomas Church as one of the foremost architectural treasures on the Avenue and in New York in general. 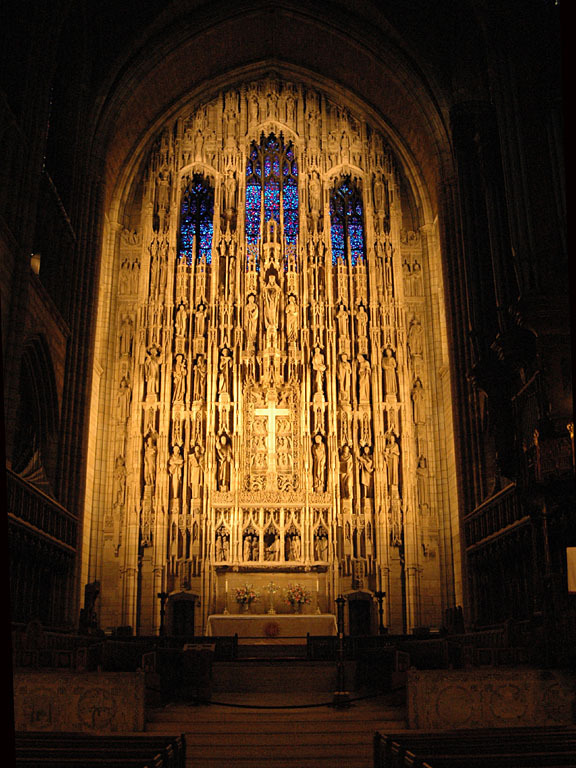 In 2007 a painstaking $20 million, 3-year restoration of the windows was initiated. The windows were, one-by-one, dismantled and each of the 9 million small pieces of glass was hand-cleaned and replaced. St. Thomas survives today on a much-changed 5th Avenue. Gone are the brownstone mansions of 1911, replaced by glass and steel skyscrapers. The sumptuous beauty of the building, however remains.